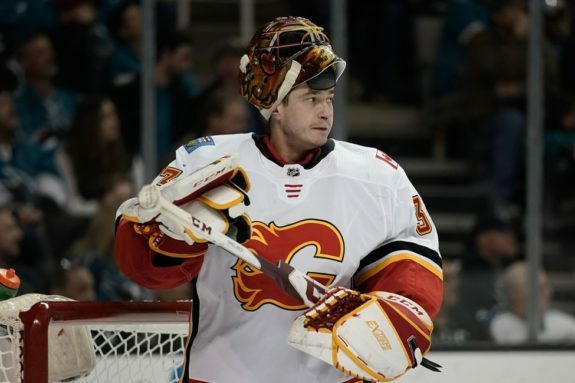 Calgary Flames Controversy in the Crease? Controversy in the Calgary Crease? Is there a goalie controversy brewing in Calgary? If not, should there be? The question wasn’t relevant when the season started, with Calgary Flames goaltender Mike Smith as the clear-cut number one and David Rittich sliding into the backup role after a less than stellar preseason. However, 15 games into the 2018-19 NHL season a debate is brewing as to which goalie gives the team the best chance to win every night. 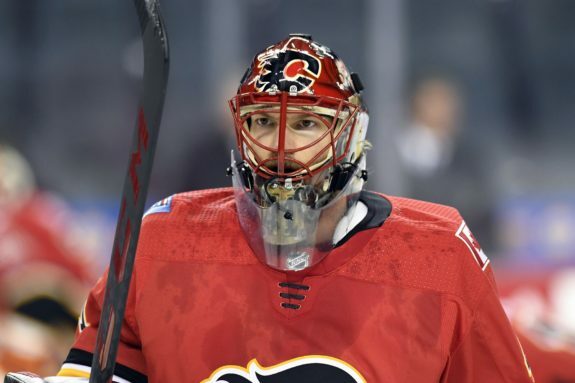 As one of the most competitive players on the Calgary Flames, Smith can never really be counted out of any contest and he often shows an innate ability to make game-saving stops at key moments. That being said, it’s the growing number of ‘stoppable’ shots that are eluding the Flames netminder that’s cause for concern, especially when it comes to team confidence. Smith is averaging 3.4 goals per game through 10 starts this year, posting a 5-4-1 record with a 3.71 goals-against average (GAA) and a .871 save percentage (Sv%). With the growing number of low percentage shots resulting in goals against this year, it raises questions about the soon-to-be 37-year-old’s durability. While it’s difficult to quantify, Smith’s puck-handling ability and mobility provide an invaluable service to the Flames and in particular, their young defensemen. While his sojourning style of play may add a few grey hairs to the coaching staff, Smith’s ability to intercept dump-ins and distribute the puck to his defensemen alleviates a significant amount of wear and tear on the d-core. The Flames are playing well, leading the pack in a tough Pacific Division and with the number of games Smith is expected to play, he is still projected to have a 39-win campaign. But are his tenure, intensity and intangibles enough to justify that Smith gets that many games, especially when the number-two netminder in Calgary is putting on a clinic this season? There is no question at this point that David Rittich is a competent backup goaltender and a solid teammate, but to claim he is ready to be a bona fide starter in the NHL is a bit premature and based on a rather small sample size. It is difficult to predict how a goaltender will respond to the rigours of a starting role, from the physical toll it takes to play the majority of an 82-game season and the pressure that is applied to any goaltender who is saddled with that type of responsibility. Is Rittich up to the task? Last season, the answer would have to be; not yet. But as a backup last season Rittich was solid, helping the Flames pick up points in six of his first seven starts (4-1-2) of the 2017-18 season. He put up impressive numbers with a .934 Sv% in December, however, the new year was a different story. When Smith went down with injury, it was up to Rittich to man the helm until his return, which was a task most believed would be a breeze based on his performance in the first two months of the season, but it didn’t pan out that way. January was Rittich’s busiest month, with nine starts. He picked up just three wins in that span (3-5-1) and finished the month on a four-game losing streak, posting a .893 Sv%. February wasn’t much better, as the now 26-year-old went 2-3 with a three-game losing streak to finish the month. Again, it is hard to truly assess the play of a young goaltender with a limited sample size, but it seems Rittich benefitted more from playing once every 10 days or so as opposed to playing every other night. Now in 2018-19, Rittich is proving again that he is an NHL caliber goaltender, and perhaps his experience last year taught him a thing or two. He has appeared in seven of the Flames’ first 15 games, in some cases in relief of Smith and has a 4-1-0 record, with a 2.24 GAA and a .927 Sv%. His GAA is 0.62 points under the league average (2.86) and at 2.24, he ranks 8th among NHL goaltenders. It’s hard to argue with the numbers and it’s also hard to discount the growing air of confidence that accompanies the team and the fans during each of Rittich’s starts. First and foremost, a goaltender should give his team the chance to win. With the Flames (9-5-1) sitting atop the Pacific as of this writing and second in the Western Conference with 19 points, it’s clear that both goaltenders have been doing their job at least well enough to help the team reach that mark. Still, the Flames need more than just ‘good enough’ if they want to see postseason action but looking on the bright side, rather than internal controversy the internal competition should be beneficial for both goaltenders and ultimately for the Flames moving forward.